FINDING NEMO Mr. Ray Ocean Lights & Music Gym is rated 4.7 out of 5 by 27. Climb aboard, friends! The world is your underwater oyster with this baby gym. Mr. Ray’s cheerful stingray canopy invites all the little fish in the sea to play and explore. Hang out with your favorite Finding Nemo characters, like Crush, Dory and Pearl. Plus, of course, everyone’s favorite clown fish. Nemo! All the fishy friends are detachable on-the-go toys. You can bring the magic of Nemo anywhere! The seaweed-inspired prop pillow is like your baby’s own anemone… amnemonemomne?... home during tummy time. When laying on their back, babies can gaze up at Mr. Ray’s captivating lights. Get in on the playtime with your baby using the Dory finger puppet. This play gym will make memories that even Dory couldn’t forget. Dimension (in) 32" x 36" x 18"
Rated 2 out of 5 by Chris737 from One defective part Overall it's ok. A bit flimsy. One part we received was defective: the Dory plush tag is too small and the ring won't fit. I called the Kids 2 help number, and they acknowledged it can be a problem, but wouldn't send a matching replacement. We will exchange the entire set, and hope the next is right. Rated 5 out of 5 by Ronnie from Tummy Time lifesaver This is great for tummy time! The mat is great for baby boy to lay on and to lift up on! Rated 5 out of 5 by RWC15 from Total baby fun! What a cute, bright and fun toy that provides loads of entertainment. Rated 5 out of 5 by Theonlylana from Love it! Good quality and great to place baby for some tummy time and laying on their back. Good amount of hanging toys included for them to grasp at and very vibrant colors. I would definitely recommend this play gym mat! Rated 5 out of 5 by Reelgrl from Adorable & Fun! This play gym is so cute and useful! 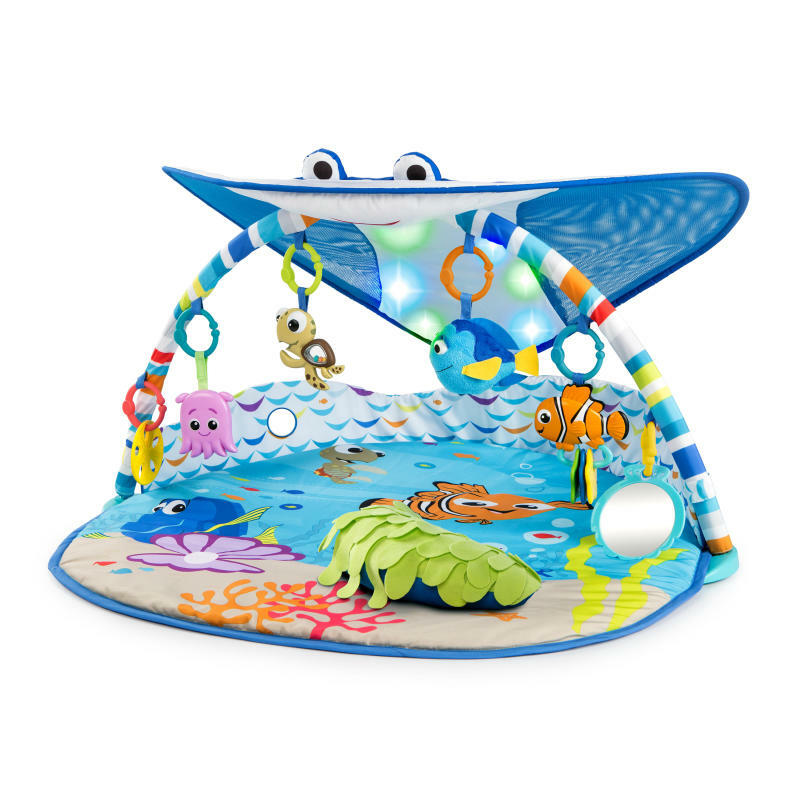 There are three ways it works: there is a Melody mode that pairs playful music with flashing lights, an "Eye-tracking mode" which makes soothing water burble sounds and ship's bells ringing as the lights slowly move, and a lights only mode where the toy is silent as green and blue lights blinking on Mr. Ray's back. It is a great place to tuck the little one in so she can safely and happily be entertained nearby as I read to her big sister. (And the controls are easy enough that my toddler figured out how to activate it as soon as I set it up - she loves being able to help by turning it on!) Along with being a great toy, I was also impressed by how the company stands behind their products. When I opened the package I had received, there was a broken part. I contacted them, and they mailed me a replacement. Good customer service is very important in my eyes, and they proved they have it! Rated 5 out of 5 by jbpri from Bright, Colorful & Entertaining This is the perfect activity gym for your new baby. Bright lights, soft music, vibrant toys and engaging toys will keep your little one entertained for hours. This is activity gym that can grow with your baby as he/she has daily tummy time. This is also great for developing hand eye coordination and motor skills. Highly recommend! Rated 5 out of 5 by sdh2017 from Got this a few weeks ago and love it. Lots of activities to keep my little one engaged!